John Panting was born in New Zealand in 1940, and came to the UK to study sculpture at the Royal College of Art in 1964. He very quickly established a reputation and a career for himself as both a sculptor and a teacher, and when he died in a road accident in 1974, he was already Principal Lecturer in Sculpture at Central School of Art, and his work sufficiently recognised to be included in such shows as British Sculptors ‘72 at the Royal Academy. This will be our first chance to look at John Panting’s work in any significant degree since the retrospective held at the Serpentine Gallery in 1975. A study of the catalogue for that show gives one the sense of a whirlwind talent in action, able to move through a whole lot of different strategies in order to uncover more incisive conditions for his sculpture. In what appears like an impatience for progress, he dashes off any number of brightly coloured fibreglass wall and floor-based works in the Sixties; he begins to get into steel and wire tension structures around 1967; is fully into stunningly beautiful if rather literal spatial explorations of great ingenuity by 1969/70; by 1972 he has abandoned the tension wires for more restrained and architectural spatial constructions in steel; and by 1972/74 he has a whole diverse body of work in progress, ranging from thumping great wood and fibreglass mad-cap assemblages, through to delicate little Perspex and wire maquettes of great spatial subtlety. It was around 1972 Panting began making the small sculptures in the present show, these utterly pared-down variations upon imagined space and form. It's not right to think of them as small models for translation into bigger sculptures. These are the real thing in their own right, both beautiful and intelligent at the same time, and beautiful because they are intelligent. They are, surprisingly, rather more seductive than they are intellectual, but the thinking behind them is lucid and relaxed. They have more physicality than many a bigger, heavier sculpture. They are made from tiny and delicate material, all of the same size, but the scale and handling seems to carry variety of expression by the expedient of geometry and inflection. The most extraordinary thing, perhaps, is the imaginative variety of their forms, given the limitations of their means. The variety, the delicacy, the vulnerability of these works persuade us of Panting’s unique and natural talent for sculpture. In their marriage of sensibility and intellect, it would be difficult to imagine a more timely and pertinent rediscovery. John Panting, by Peter Kardia. The work in this exhibition comes from the period 1972-1974. In these small-scale works can be seen much that inspired John Panting throughout his career and which was also apparent in the numerous large-scale works he produced. All of his sculpture involved an intense concern with the sense of space that arises from strongly defined linear elements, but he also had a compelling sense of the volumetric, of the tactile, the type of experience that often comes to us when we are confronted with and seek to comprehend large solid objects. When the works he produced are viewed and their complex and constantly changing assemblies of visually defined areas are experienced from the varying positions one takes up outside their physical boundaries, one is constantly being drawn into the physicality and materiality of the work. The claims that are made by these sculptures also provoke an empathy, an imagined entry into the work, with the elements of structure being experienced as if in and through one’s own body. Standing before his work makes one register that one is being drawn into viewing significant sculpture. We realize that the manner in which the work determines our experience relates to the reading that was given to the term many years ago when it was said “By aesthetic idea, I mean that representation of imagination that induces much thought, but without any thought whatever being adequate to it”. Many believe that had his career not ended so tragically John Panting would now occupy a significant place in contemporary sculpture. John was not an artist who worked to a theory, although if one prompted him he would give clear indications, for example, that he had an extended knowledge of notions concerning perception and the various processes that are involved. But throughout his career he never subscribed to the idea of the artist functioning as a designer, with an initial idea being given material form by a group of craftsmen, as is the custom in much contemporary work. For John the continual involvement with the substance, the material that he was working with in his sculpture, handling it, lifting it, bending it, were all part of a process involving that aspect of his work that has been referred to. This emphasis on materiality, on substance, was then bonded together with elements from a very different, and for John an equally crucial factor in experience, namely the process in perception of the construction and deconstruction of visual gestalts. In the work that he was making in the mid-Sixties it was clear that his concern for the volumetric was very active; the sculptures were usually fashioned in fibre-glass and when the units were formed, smooth, refined surfaces were clearly thought to be crucial. In many of the works a number of separate components were involved. These were then assembled in the sculpture to produce a sense of structural unity. His insistent requirement to activate and combine the tactile and the visual was clearly in operation. As his work progressed, fibre-glass became less frequently used and the dominant material became welded metal. With this material John produced a considerable number of large works. Many of these works appeared to have a common theme; at various points on their overall structure they contained complex and clustered assemblies of linear metal rod units. Although it can be said that these structures functioned in a number of different ways, there were two crucial elements. Each metal rod reached out into space, each one in a unique direction. Persuaded by the specific orientation of each rod, the experience of the work was that of being continually moved out by linear definitions into the space surrounding the work, returning to the structure when the line that was being followed came within the orbit of another metal rod unit. This continual process meant that the experience of standing in front of the work, a structure in which clustered assemblies of metal rods were pointing in a whole variety of different directions, was that of inhabiting a defined and continually redefined volume of space. Within the actual structures themselves one was able to travel along the linear elements until one met one of the metal rod clusters, where the evidence of the intense working involving their binding and their separation again activated an empathy involving bodily experiences - tactility, muscular tension and release. A number of the sculptures that were made at this time continued with the process encompassing spatial volume by means of linear metal structures but also included metal elements that were clearly flexible. With these elements being attached to the overall structure at points with a smaller distance between them than the length of the rods, the flexible metal elements were bowed out into space. Without rigidity of definition, these encompassed spaces produced a sense of pulsation and once again we find John seeking to include in the sculpture he produced a sense of bodily identification. In the Serpentine Gallery Retrospective exhibition catalogue of 1975, some of the works that are included in this exhibition were referred to as sketch models. It may well have been John’s intention that the specific forms of some of these works would have led to other, possibly larger versions. However, it was not uncommon for him to re-use formal elements and configurations in one work, even in some of his larger sculptures, as the model or basis for a subsequent work. These small works, on closer examination, seem to have a very distinct characteristic (this feature being significant when it is considered in relation to what has been identified as an important element in John Panting’s work and that might be referred to as the visible evidence of the handling of the materials). The material from which these small works are made has an anonymous quality. We are given very little assistance in making those rapid judgments that we make in ordinary behaviour to decide the scale and size of the object in front of us. The result is that momentarily but repeatedly our own position in space is challenged. We must question very vigorously where we are located when in front of each work. We are experiencing what appears to be the assembly, definition and redefinition of ever-changing volumes of space. The modest scale of these sculptures does not preclude them from being an extremely challenging experience. When we visit this exhibition, even though the works are all of a modest scale, the demands that they make on our experience of space, volume and substance make us deeply regretful that John Panting was not able to continue his vigorous and deeply penetrating journeys into the world of sculpture. The Sculpture of John Panting, by Jon Wood. Photography has been crucial to the envisioning, representation and interpretation of sculpture for many decades now. It has also played an important role in the presentation of its makers. At the beginning of the catalogue to his retrospective at the Serpentine in 1975 there is a photograph of John Panting installing one of his welded steel sculptures. As well as 'installing', he seems to be deeply implicated in the sculpture: his whole body as well as his hands engaged, both feet astride it and his head and arms locked into the sculpture. Two years later in 1977, in the catalogue for the Silver Jubilee Exhibition of Contemporary British Sculpture, Panting - appearing alphabetically between Paul Neagu and Eduardo Paolozzi - is presented not in the studio or gallery, but on the street. Looking up at the photographer, with his body half-turned, and framed diagonally by a basement trench, a stretch of iron railing and gate, a passage of pavement and a single yellow line on tarmac, it is a surprising and powerful photograph, and quite unlike anything else in the catalogue. With the look of a film still, it seems a deliberately 'intellectualising' image, full of ambiguities and designed to spark questions. What kind of sculptor could this bespectacled 'man on the street' be? Was he about to turn around? Was this a spontaneous image or a carefully choreographed one? Most strikingly of all, this photograph - with its intriguing play of line, depth and surface - seems to be directly in dialogue with his rectilinear, steel sculpture 'Untitled IV' (1972-73), reproduced on the opposite page. Ambivalence charges this photographic juxtaposition as it does his sculpture. Questions soon follow: what is foreground and what background, what foreshortened and what lengthened, what overlaps and is resting on what, what supported and what 'gravity defying', what 90 degrees and what 45 degrees…questions that are poised as carefully as the glasses on the end of his nose. Returning to the sculpture made between the mid-1960s to late-1970s in Britain, it is sometimes tempting to chart a schematic landscape of doctrines, contests and rivalries, 'A' courses and 'B' courses and a 'sculpture community' populated by artists who were either makers or thinkers, either practice-based or theory-based. Whilst there is much to this division in institutional terms, separating sculptors (at its crudest) into those who use their hands and those who use their heads will always be a caricature that erases the complexities and subtleties of individual practices and closes down their possibilities. Panting can be seen as a good example of a sculptor whose dextrously thoughtful work gently unsettles these categories - a prime example of an oeuvre that combines the head and the hand, the aesthetic and the intellectual. His role as Head of the Sculpture Department at Central School of Art from 1972 of course gives this characteristic an extra resonance. 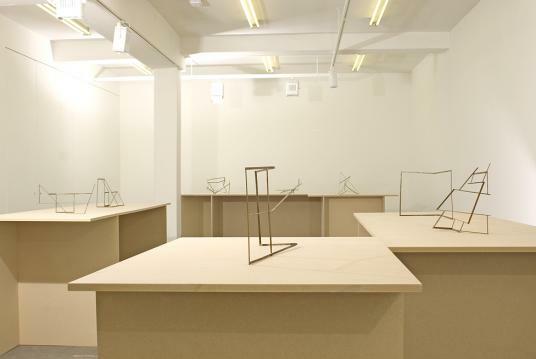 Looking at his work of this time, there is at once simplicity and pragmatism - a 'five, six, pick up sticks' attitude to sculpture making - and also an evident preoccupation with theories of visual perception and gestalt psychology. Panting's sculpture is '1 + 1 = 3' sculpture: not just 'drawing in space', but the intuitive and well-read construction of illusionistic and highly spatialised games that move elegantly between point, line and plane. They are envisioned simultaneously as image and shape, and employ photography to promote specific views and compositional strategies before a moving viewer. As the literature demonstrates, the formal and conceptual complexity of his sculpture was appreciated at the time: its ambivalent qualities discernible in the ways that his former colleagues celebrated his work in 1975. William Pye celebrated the combination of intellectual asceticism and sensual expression, and R.J. Rees stated that 'his instinct for the richness of sculpture led him to merge disparities and encourage contradiction'. It is also seen by the place his work occupied in the 1977 Battersea Park exhibition and, during his lifetime, in the groundbreaking British Sculptors '72, selected by Bryan Kneale at the Royal Academy. But what about Panting today and in retrospect? What works, for example, would a group show with Panting's work at its core today include? We might, for example, find the work of Bill Tucker, Garth Evans, John Cobb, Katherine Gili, Steven Furlonger, Jeffrey Lowe, Brian Wall, Tony Smart, Peter Hide, Nigel Hall, Norman Dilworth, Michael Kenny and Charles Hewlings. We might well find the work of the 'New Generation' sculptors. We might also find, if looking across the Atlantic, the work of Sol Le Witt, Kenneth Snelson, Fred Sandback, and George Rickey, Finally, it might include the work of artists such as Bruce McLean, Richard Long, John Hilliard and Jan Dibbets. To see Panting's 'Leaning Triangle' of 1970 - a work which anticipates the small sculptures on display here - in the same exhibition as Dibbets' 'Studio Perspective corrected' of 1969 would be fascinating indeed. Perhaps it would reveal commonalties as much as differences, and open up discussion not only of John Panting's work, but also of abstract sculpture and sculptural thinking of this period in general in new and surprising ways.